As we build up to our move to Zambia to oversee an independently evaluated trial of the ColaLife concept, interest in what we are trying to achieve has reached new levels. In the last few weeks we have had three mentions in HELLO! Magazine (@hellomag) with a full-page spread in the 22 August 2011 issue. This has been thanks to Honda’s Dream Factory initiative which I am very pleased to be a part of – I’m one of the nominated ‘Cultural Engineers’ – we are all dreamers who are trying to make their dreams come true! There are some interesting people in this group and we are all getting together for the first time in November in the Guardian Offices in London . . . . more on this later. Popular media is all very well and it really boosts our supporter numbers which has been important and has given us the power we need to engage the powerful organisations required to make ColaLife work. But when it comes to funding, credibility is important and it helps if you feature in UN Publications and academic publications like The Lancet. We were in both this week which is more than we could have hoped for. 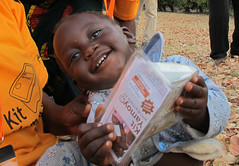 On Monday (12/9/11) a thematic report – Innovating for Every Woman, Every Child – was published by the UN’s Every Woman, Every Child initiative (EWEC) looking at innovation in the areas of child and maternal health. 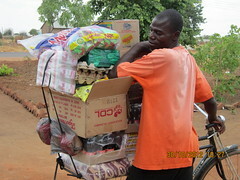 The report is being published, as a peer reviewed report, and distributed through The Lancet. You will need to register and download the PDF version. This is all very inaccessible, however, thanks go to Talea Miller of PBS Newshour for writing about the report and choosing to highlight ColaLife in this blog post on the PBS Newshour site. 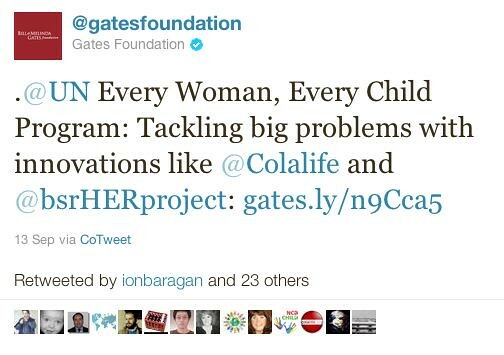 This blog post has generated quite a lot of excitement on Twitter with an original tweet by The Gates Foundation being re-tweeted many times. What I’m really looking forward to though is the publication of the results of the ColaLife trial in The Lancet in a couple of years time!